Frozen foods are convenient, relatively inexpensive and possess a fairly long storage life. They provide more variety than canned foods and less preparatory time than creating a meal from scratch. Frozen foods can be risky for those on a low-sodium diet, however, and often contain enough sodium to be considered unhealthy even for those with a regular diet. Hundreds of frozen dinners are available at supermarkets, ranging from petite low-calorie meals to large, high-calorie dinners. Appetizers and snacks also fit into the frozen food category; these products typically contain meat, cheese, potatoes or breaded vegetables. 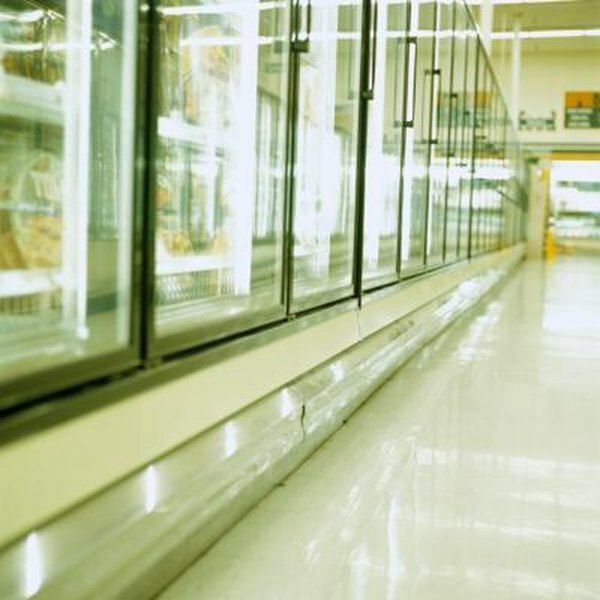 Frozen pizzas, breakfast foods, vegetables, fruits, meats, poultry, fish, seafood, ice cream and desserts utilize most of the remainder of freezer shelf space in the typical American home. Processed foods such as frozen dinners, pizza, appetizers and snacks are often high in sodium primarily because the American palate is accustomed to salty foods. Sodium-free meats and combination foods such as pizza are generally not considered tasty and the food industry responds by placing salt where it is expected. Salt is also easier to obtain and cheaper to use than higher-quality flavorings, spices and herbs. Sodium is added as a preservative in some foods. To choose a low-sodium frozen food, first consider fruits and vegetables. Many are prepared without added salt. Seek frozen dinners that have "healthy" on the label or in some other way indicate that they are made with nutrition in mind. You still must check sodium content on the label, as many so-called healthy dinners are fat and calorie-controlled but still contain excessive levels of sodium. According to the University of Maryland Medical Center, healthy Americans should ingest 2,300 milligrams or less of sodium each day while those with high blood pressure or other medical conditions should consume even less. Given this recommendation, you should seek meals that have no more than 500 milligrams of sodium and snacks that have no more than 300 milligrams per serving, unless directed otherwise by your physician. The best way to avoid excessive sodium in frozen food is to make your own meals. Purchase freezer-safe containers and thick bags and prepare single-serving portions of fruits, vegetables, beans, soup and breakfast foods. To make frozen dinners, use divided containers and cook meat or poultry and two vegetables or fruits, allow them to cool, place individual servings in the containers and freeze. You can also make stir-fry bags by grilling chicken or lean steak and adding them to freezer bags with fresh stir-fry veggies such as broccoli, onions, carrots, cabbage, mushrooms and red peppers. MSNBC: Should You Defrost Your Diet?